The Khatris are an artisan community in Kachchh. Rang utharna aur rang chadana, the art of adding and removing color, has been their work for centuries. Archaeologists made an exciting discovery at one of the sites of the Indus-Saraswati Harappan civilization. They unearthed 3000 year old strands of cotton dyed with madder (red) at an ancient dyer’s workshop in Mohenjo-Daro. During the 7th century, the Khatris of Sindh were Hindu. It is said that Sindh was invaded by Arabs and forced the people to convert to Islam. Those who converted stayed in Sindh. Those who refused fled to modern-day Kachchh. “The dyeing techniques of Khavda compared to other villages was the same. But the weather and the water was different, and so the shades of the color were different." “There was a carpenter, a weaver, and a potter in every village. The need for cloth in the village was met with the weaver of the village itself. The Khatri people would do the work of the bandhani, the printing, and the coloring according to the needs of each community." “We used to work with the different Maldhari communities. Each had a distinct style, a distinct color palette and design. They never changed styles and we never changed the Ajrakh design. You see, it was a source of identity for them." In 1947, India and Pakistan were divided. It was no longer possible to cross the border and the trade between East Kachchh and Sindh collapsed completely. Soon, industrialization in India began which affected trade with the local communities who started wearing cloth produced by mills. There is a strong tradition of using natural colors in printing techniques in Kachchh. Indigo blue and madder red were often used together by printers. They enhance each other and have become the identity of the colors from this region. Known as Patthar printing in these areas, this genre closely resembles the stylized forms of the Sirakh. The communities known to print them were both Muslims and Hindus. The Hindus were settled mostly in the Nana and Mota Angiya villages of Nakhatrana. 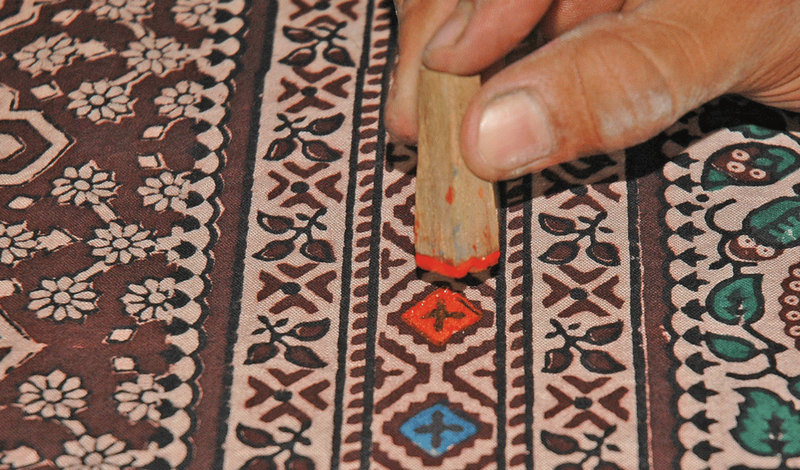 The artistic sirakh, a printed bedcover, uses a lesser known traditional style of hand block printing. It is made of bandhani or block print, and its design is believed to be a precursor to Ajrakh. The patterns used were very floral and free flowing. By the early 1950s, synthetic dyes had replaced most of the natural color in the Indian textile market because of their cheapness and ease of use. Simultaneously, local printing workshops were being threatened by large industrial factories in Mumbai and Ahmedabad that could produce cloth faster. The special look of Batik in Kachchh developed by coincidence when artisans started using paraffin wax. The character of paraffin wax was such that it would crack while dyeing and leave fine lines of colors on the cloth. Earlier, fabrics displaying these cracks were considered as poor quality, but over time it evolved as the identity of Batik textiles from the region. Growing competition with factories pushed artisans to embrace changing technologies. Instead of the elaborate hand block print, artisans started shifting to mass production in screen print. The new screen printed fabrics were lighter, brighter, and cheaper than block printed fabrics. The rise of factories had nearly buried the value of handicraft. In the 1970s a period of reflection started. The Gandhian idea of India as a “craft nation” became popular again and many states in India initiated programs to support traditional craft artisans in finding new markets. Disaster struck the region of Kachchh and the Khatris for the second time in 50 years. In 2001, a fatal earthquake took the lives and homes of thousands of people. Dhamadka, the heart of the block printing community, was completely destroyed. A tenth of the population died instantly. Today many Khatris work with international fashion designers and retailers. This opens more opportunities but demands high quality in work and innovative ways of design. The design school of Kala Raksha Vidhyalaya has empowered artisans to explore new artistic expressions. These days we use Whatsapp! “Clients call me themselves, or these days they have started Whatsapping me. In a second, the design gets fixed and the order gets finalized. We should take care of our customers when they visit us and make them understand about the value of our work." While Ajrakhpur was selected due to its good water source, the water tables are lowering and the need of a sound water managemtn plan is being discussed by the block printers along with various organizations and experts. As of yet, a comprehensive plan has yet to emerge. Like traditional crafts everywhere, the future often feels uncertain. But in Kachchh there are both fears and hopes. There is an emerging younger generation that sees the potential and growth of their traditional businesses and dare to imagine new futures. It often seems that there are two worlds of printing: the earthy colors of natural dyes rooted in tradition, and the contrasting bright and cheerful character of chemical colors. However, some printers serve both according to the demands of the market.